Exhibited in Disrupting Undoing Salon (juried), April 1–5, 2013 at the Open Gallery, OCAD. 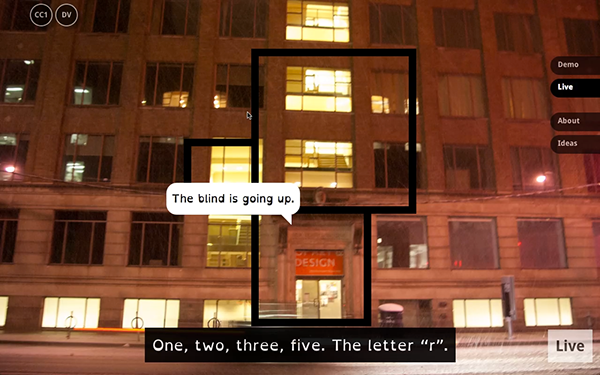 Blind Reading was an installation consisting of a motorized mechanism to move a set of window blinds according to a preprogrammed schedule derived from an encoded message, and a website that decodes this sequence of blind movements back into its original, unencoded form of an English sentence. 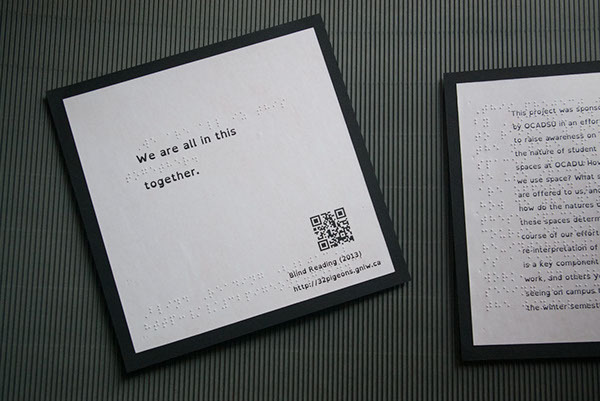 A QR code on an information panel directed the viewer to a website where the blind movements could be decoded, revealing the original message. The virtual portion of the installation thus acted, in a way, as an “assistive technology” for people who would normally not consider themselves to be disabled and in need of assistive technologies. Originally conceived as a site-specific installation at the Inclusive Design Research Centre (IDRC)’s “Distributed Collaborative Laboratory” at 205 Richmond Street West, Blind Reading traces its roots to the desire to raise an awareness within OCAD of the existence of the IDRC and the Inclusive Design program. 49 McCaul Street as part of the Disrupting Undoing Salon from April 1–5, 2013. 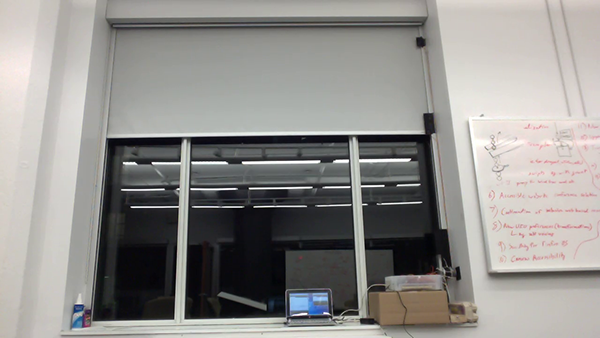 In its original site-specific form, the motor was directly attached to the window blinds of the Distributed Collaborative Laboratory. The physical portion of the installation was controlled by code in the Arduino, which periodically sent out status messages to the serial port. 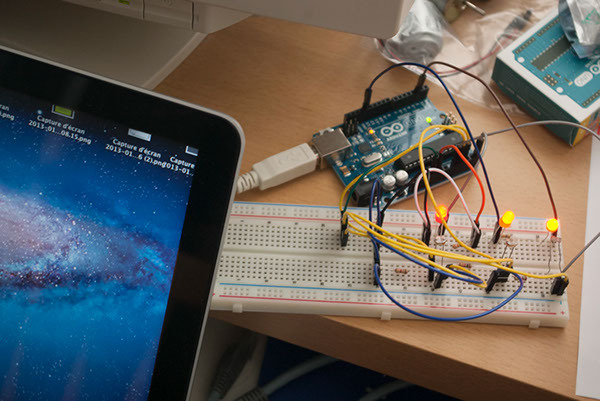 Since serial communication is nonblocking on the Arduino, the two, combined, can function as a standalone installation if we do not need the messages to be decoded through a website. In order for the decoding to happen, the glue code on the laptop relayed these status messages to the web backend using a simple text-based protocol. To avoid excessive network traffic, the set of status messages was pre-filtered. At the web backend the status messages were interpreted to determine the current state of the window blinds, and the sequence of such states was decoded, if possible, into its original unencoded form. Both of these were saved to a JSON-encoded text file which served as a shared message store between the front- and backend. The visitor interacts with the installation by watching the physical installation and optionally watching the captions and descriptions provided by the Live Broadcast page. 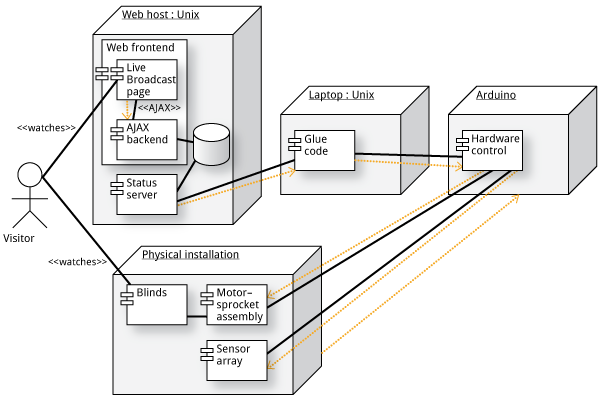 The physical installation requires the Arduino to work, but the code in the Arduino also, in turn, depends on the motor–sprocket assembly and the sensor array on the physical installation to work. The primary means for the installation to detect the position of the blinds was a set of three sensors, each consisting of an LDR (light dependent resistor) paired with a LED (light emitting diode) blinking at a controlled, constant rate while the installation was running. As the LDR is known to lack the ability to accurately measure ambient lighting conditions, the LED’s were designed to blink, which artificially introduced a difference in light levels near the LDR. The assumption was that if a blind was blocking the path between the LDR and the LED, the additional light from the LED should not reach the LED, and so the LDR should detect no difference between two successive reads; on the other hand, if the path between the LDR and the LED has not been blocked, the LDR should be able to detect increased light levels. The LDR–LED pair should thus be able to determine the presence or absence of blinds without knowing how the ambient lighting conditions would affect the LDR’s measurements. A delay in the LED to respond was anticipated and so an approximately-100-millisecond delay had been inserted between flashing the LED’s to getting readings from the LDR’s. In the modified version exhibited at 49 McCaul Street, the bottom sensor was replaced by a limit switch to improve sensor array accuracy. When people saw this, they often asked, “How does this work?” Many did not in fact realize they were looking at an art installation. But besides the imposing-looking physical structure, many also noticed the blinds’ movements: They realized something was going on but were not sure what. Indeed, being portrayed by the first facet of this work was the frustration of recognizing that something is being conveyed, without knowing how to get at that message. The time needed to observe the entire message and the obscurity of its encoding almost guaranteed no one will be able to decode it, even if determined to observe it for hours. The website, in particular the Live Broadcast page, thus served to help decode the message—an “assistive technology” if you will. On the site, the ordinary “live broadcast” underwent a reversal of experience: There was no video, but instead video descriptions and captions. In a sense, the screen reader experience became central to this second facet of the installation. The original site-specific incarnation of this piece spoke directly of the space at 205 Richmond Street West called the “Distributed Collaborative Laboratory,” alluding to the obscurity of that part of OCAD University. Having moved into a gallery, the second incarnation of the installation at 49 McCaul Street no longer made any direct references to that space.